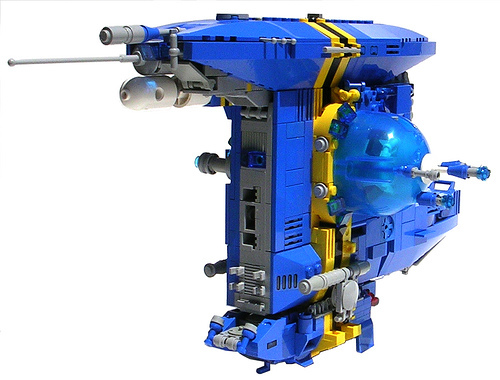 Catsy from Classic Space creates a microscale starship designed to be “a self-sustaining city in the stars,” complete with the remarkable use of the Bionicle half dome piece as a biodome on this ship. Stay tuned to Catsy’s gallery for more edited photos of this increadible and detailed creation. The long and arduous journey to planet Flickr for the rest of the pics was well worth it, even despite the currently still raw state of some of them. Top marks on detailing and colour-scheme.